So election night is almost here, but how will you be spending it? Will you be like me and be watching your particular constituency get counted? Will you be in a pub watching the results come in? Will you just go to sleep happy and content to see the result in the morning? Or will you try to get the best of both worlds by going to bed and setting your alarm for when you think that the crucial moment will be? We have decided to help you make that decision by doing some analytics. It is always worth being around at 10PM when the official exit polls are released. These are different from other polls, in that they don’t have to answer the question about whether or not people are likely to vote. Instead, they are only polling people who have actually voted. By UK law these polls cannot be revealed until 10PM on election night, but it will be an important indicator of the way the election is likely to go. There can still be problems with exit polls though, as the 1992 election showed. It is possible that people lie to the pollsters. Also, data is collected well before the 10PM close to ensure the organisers have enough time to turn around the results, which means they will miss any late surges in voting. However, in 2015, the exit poll was much closer to the final result than the polls during the campaign. So as a first recommendation, we suggest that you do not go to bed before the News at Ten. Make sure you tune in to see Mr Dimbleby announce the BBC prediction for the election, and then you can go for a few hours sleep before the real drama kicks off! What will happen during the night? As you can see there are very few seats declared before 2AM. There is then a rush of declarations between 2 and 5, at which point the pace tails off again. So when is the best time to get up and watch? Are the early seats worth watching? There are some seats where the results come in remarkably quickly. It used to be the seaside towns that prided themselves on a fast count, but in recent years it has been Sunderland that has been leading the way. They were similarly quick for the referendum last year. In the referendum the size of these early constituencies were large, and there was no useful model for how people were expecting the vote to go. When Sunderland and Newcastle both showed a much higher vote for leave than expected, this set the clear trend for the night ahead. However, in the general election things will be slightly different. 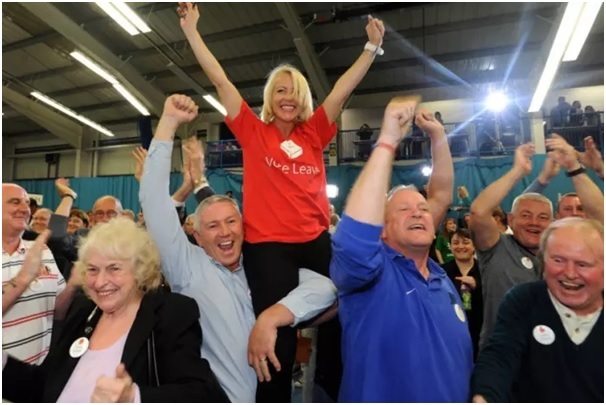 The North East seats have such large majorities, that it is difficult to extrapolate anything interesting from them (although the pundits on TV will try!). Also, turnout in these seats has been around 55% for the last few elections, which is well below the average turnout in the country (something we discussed in a recent blog). So although the early results may be interesting, they will not give a firm indication of what is likely to unfold. In order to predict what times you need to be awake to watch the most exciting drama, we need some way of estimating the likely result in each seat. We have used the Electoral Calculus and YouGov predictions for the key seats. These appear to be predicting the two extremes of the potential result, with the Electoral Calculus currently predicting a large Tory win and YouGov predicting a hung parliament. This should ensure our predictions aren’t too biased, one way or the other! For timing data, I have used the Press Association predicted times. Most of these times are mainly on the hour or half hour, so the model I have created will only look at which of these times you should be awake for. When are the key constituencies due in? The current YouGov and Electoral Calculus models give different predictions of how many seats each side will win. The Electoral Calculus estimates that the Tories will win 32 seats, whilst YouGov estimates that the Tories will lose 13. We have ordered the seats by how winnable they are in a previous blog and selected the ones that drove these predictions. This left us with 87 key seats. So when will the results from these 87 key seats come in? 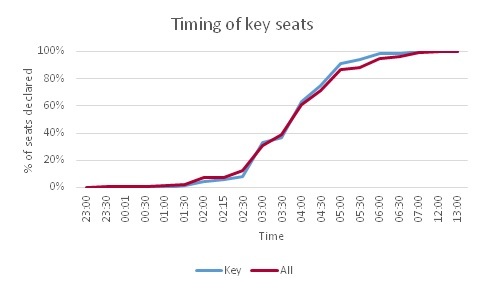 The distribution of declaration times of key seats is largely similar to that of all of the seats. But, the key seats are slightly slower to come in, and also finish slightly earlier. We ran the model several times to find out at what point during the night the final result was known. Given that the YouGov model is slightly less representative of the mainstream than the Electoral Calculus predictions, we also ran the model with a greater weighting towards the latter. We will call the model that gave equal weighting to both sources Model A, and the model with a greater weighting towards Electoral Calculus Model B. The results are interesting. Both models predict a Tory win, although Model B predicted a larger win than Model A. The majority ranged from around 30 to 50 seats. 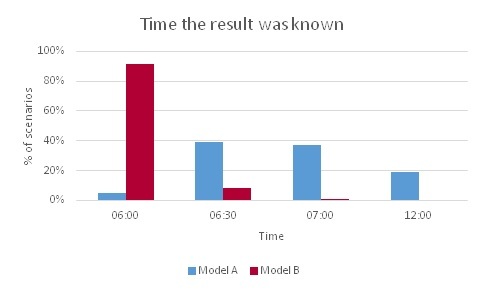 Neither model predicted any scenario in which the winning seat was achieved before 6AM, but there were differences in whether 6 or 6:30 was the time of the declaration of the winning seat, as can be seen from the graph below. So if the result is a large win for the Tories (as predicted in Model B) then the result should be known earlier than if it is close. So a majority of above 38 should be declared around 6AM, a majority of 24 around 6:30 and a majority of 12 around 7:00. 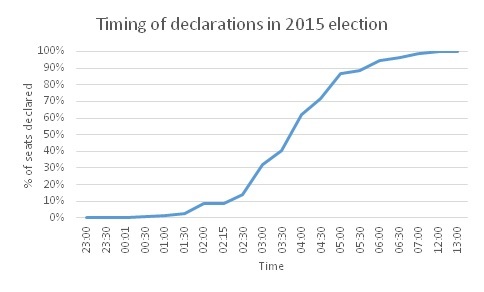 But if the result is closer, then it may come down to the last declaration which is expected before midday Friday. Remember the predictions times I have used are based on whole hours and half hours, so don’t actually expect the real result to be like that. You might want to give yourself half an hour leeway either side of the times above if you intend to use them to set your alarm! So what time should I get up? If you don’t want to be like me and stay up through the night, then the best bet seems to be to watch the exit polls at 10PM on Thursday. You should then go to bed for around 7 hours (as recommended for adults), and wake up in time to see the results come in around 6am. At this time you are likely to be able to watch the winning seat being declared within the next hour.